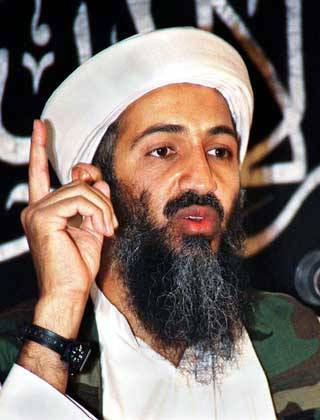 Osama bin Laden was born in Riyadh, Saudi Arabia, to Muhammad Awad bin Ladin, a wealthy businessman. His family originally came from Hadhramaut, Yemen and he was raised as a devout Muslim. After his graduation from secondary school in 1973, bin Laden went to Beirut, the capital of Lebanon. As a college student, he studied business and project administration. He also earned a degree in civil engineering from King Abdul Aziz University in Jeddah in 1979.After his father died, bin Laden inherited what was once estimated to be a fortune of US$300 million. His wealth and connections permitted him to pursue his interest in supporting the mujahideen, Muslim fighters fighting the Soviet Union in Afghanistan following the Soviet invasion of Afghanistan in 1979. By 1984 he had established an organization named Maktab al-Khadamat (MAK) (Office of Order in English), which funneled money, arms and Muslim fighters from around the world into the Afghan war. The MAK was supported by the governments of Pakistan, the United States and Saudi Arabia, and that the three countries channelled their supplies through Pakistan's Inter-Services Intelligence (ISI). By 1988, bin Laden had split from the MAK and established a new rebel group, later dubbed al-Qaeda by the U.S. government, which included many of the more militant MAK members he had met in Afghanistan. 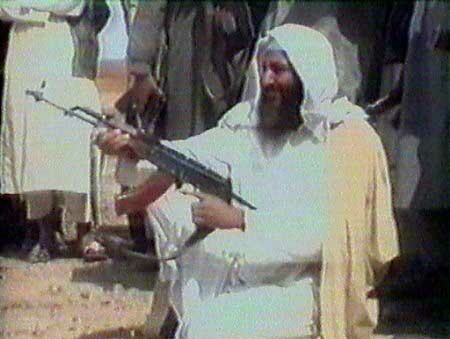 The Soviet Union withdrew from Afghanistan in 1989 and bin Laden was lauded as a mujahideen hero in Saudi Arabia. After Iraq invaded Kuwait in 1990, bin Laden offered to help defend Saudi Arabia (with 12,000 armed men) but was rebuffed by the Saudi government. 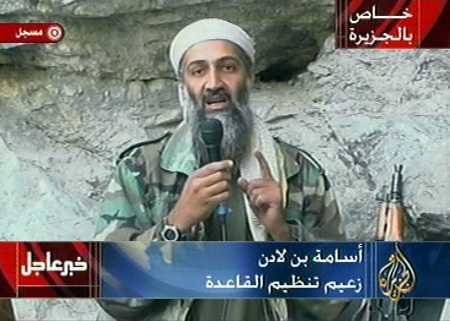 Bin Laden publicly denounced his government's dependence on the U.S. military and demanded an end to the presence of foreign military bases in the country. According to reports (by the BBC and others), the 1990/91 deployment of U.S. troops in Saudi Arabia in connection with the Gulf War profoundly shocked and revolted bin Laden because the Saudi government asserts legitimacy based on their role as guardians of the sacred Muslim cities of Mecca and Medina. After the Gulf War, the establishment of permanent bases for non-Muslim U.S. forces in Saudi Arabia continued to undermine the Saudi rulers' legitimacy Bin Laden's increasingly strident criticisms of the Saudi monarchy led the government to expel him to Sudan in 1991. Assisted by donations funneled through business and charitable fronts such as Benevolence International established by his brother-in-law, Mohammed Jamal Khalifa, bin Laden established a new base for mujahideen operations in Sudan to disseminate Islamist philosophy and recruit operatives in Southeast Asia, Africa, Europe, and the United States. Bin Laden also invested in business ventures, such as al-Hajira, a construction company that built roads throughout Sudan, and Wadi al-Aqiq, an agricultural corporation that farmed hundreds of thousands of acres of sorghum, gum arabic, sesame and sunflowers in Sudan's central Gezira province. Bin Laden's operations in Sudan were protected by the powerful Sudanese government figure Hassan al Turabi. The funding from these ventures was used to run several training camps on his farmland, where Islamists could receive instruction in firearms use and the use of explosives from former Afghan mujahideen. Around this time, bin Laden and his associates began developing and executing a series of meticulously-planned terrorist attacks. In 1995, the Saudi Arabian government stripped bin Laden of his citizenship after he claimed responsibility for attacks on U.S. and Saudi military bases in Riyadh and Dahran. Bin Laden is officially wanted by the United States in connection with the August 7, 1998 bombings of the United States embassies in Dar es Salaam, Tanzania and Nairobi, Kenya, that killed 225 people and injured more than 4000. 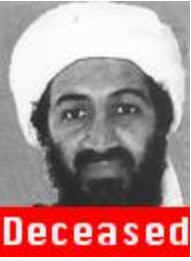 Since June 1999, bin Laden has been listed as one of the FBI Ten Most Wanted Fugitives and FBI Most Wanted Terrorists. Al-Qaeda was allegedly involved in several unsuccessful conspiracies, including the 2000 millennium attack plots to bomb Los Angeles airport, several tourist sites in Jordan and the USS The Sullivans, and well as the subsequent Paris embassy terrorist attack plot. The al-Qaeda organization was allegedly responsible for the successful USS Cole bombing in October, 2000. In response to these attacks, President Bill Clinton ordered a freeze on assets linked to bin Laden. Clinton also signed an executive order authorizing bin Laden's arrest or assassination. In August 1998, the U.S. military launched an assassination attempt using cruise missiles. The attack failed to harm bin Laden but killed 19 other people. "I have already said that I am not involved in the 11 September attacks in the United States. As a Muslim, I try my best to avoid telling a lie. I had no knowledge of these attacks, nor do I consider the killing of innocent women, children and other humans as an appreciable act. Islam strictly forbids causing harm to innocent women, children and other people. Such a practice is forbidden even in the course of a battle.... The United States should try to trace the perpetrators of these attacks within itself.... intelligence agencies in the U.S., which require billions of dollars worth of funds from the Congress and the government every year. This [funding issue] was not a big problem till the existence of the former Soviet Union but after that the budget of these agencies has been in danger. They needed an enemy. So, they first started propaganda against Usama and Taleban and then this incident happened. You see, the Bush Administration approved a budget of 40 billion dollars. Where will this huge amount go? It will be provided to the same agencies, which need huge funds and want to exert their importance. Now they will spend the money for their expansion and for increasing their importance. I will give you an example. Drug smugglers from all over the world are in contact with the U.S. secret agencies. These agencies do not want to eradicate narcotics cultivation and trafficking because their importance will be diminished. The people in the U.S. Drug Enforcement Department are encouraging drug trade so that they could show performance and get millions of dollars worth of budget. General Noriega was made a drug baron by the CIA and, in need, he was made a scapegoat." In December 2001 U.S. forces in Afghanistan captured a videotape during a raid on a house in Jalalabad, in which he discusses the September 11 attacks with a group of followers. However, the quality of the tape is poor, and Osama is seen writing with his right hand, although according to the FBI he is left handed, among several anomalies. Several other videotapes have surfaced in the media. In subsequent statements and interviews he expressed admiration for whoever was responsible. He took credit for "inspiring" of September 11th in several public statements. One leading al-Qaeda member, Khalid Shaikh Mohammed, says (according to his interrogators) that the idea for the attacks came from him and not from bin Laden. Khalid has been in United States custody since September 2003. The extent to which bin Laden was involved in funding or overseeing the operation is unknown. Whereabouts After the September 11 attacks, the United States asked the Taliban government of Afghanistan to "hand him over." The Taliban counter-offer to try bin Laden in an Islamic court or extradite him to a third-party country was deemed unacceptable by the U.S. government. 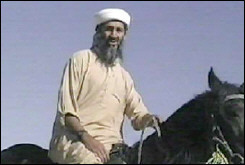 The U.S. invasion of Afghanistan resulted in the death or arrest of many members of his organization, as well as many civilians (estimates range from thousands to 49,000), but bin Laden was not found. There had been suggestions that bin Laden was killed or fatally injured during U.S. bombardments, most notably near Tora Bora, or that he may have died of natural causes. The U.S. military had reported that bin Laden suffered from a kidney disorder requiring him to have access to advanced medical facilities, possibly kidney dialysis. Ayman al-Zawahiri, also an FBI Most Wanted Terrorist, is a physician and may have provided medical care to bin Laden. In February 1998, the 40-year-old Saudi exile Usama Bin Ladin and a fugitive Egyptian physician, Ayman al Zawahiri, arranged from their Afghan headquarters for an Arabic newspaper in London to publish what they termed a fatwa issued in the name of a "World Islamic Front." A fatwa is normally an interpretation of Islamic law by a respected Islamic authority, but neither Bin Ladin, Zawahiri, nor the three others who signed this statement were scholars of Islamic law. Claiming that America had declared war against God and his messenger, they called for the murder of any American, anywhere on earth, as the "individual duty for every Muslim who can do it in any country in which it is possible to do it." Three months later, when interviewed in Afghanistan by ABC-TV, Bin Ladin enlarged on these themes. He claimed it was more important for Muslims to kill Americans than to kill other infidels. "It is far better for anyone to kill a single American soldier than to squander his efforts on other activities," he said. Asked whether he approved of terrorism and of attacks on civilians, he replied: "We believe that the worst thieves in the world today and the worst terrorists are the Americans. Nothing could stop you except perhaps retaliation in kind. We do not have to differentiate between military or civilian. As far as we are concerned, they are all targets." Note: Islamic names often do not follow the Western practice of the consistent use of surnames. Given the variety of names we mention, we chose to refer to individuals by the last word in the names by which they are known: Nawaf al Hazmi as Hazmi, for instance, omitting the article "al" that would be part of their name in their own societies. We generally make an exception for the more familiar English usage of "Bin" as part of a last name, as in Bin Ladin. Further, there is no universally accepted way to transliterate Arabic words and names into English. We have relied on a mix of common sense, the sound of the name in Arabic, and common usage in source materials, the press, or government documents. When we quote from a source document, we use its transliteration, e.g ,"al Qida" instead of al Qaeda. Though novel for its open endorsement of indiscriminate killing, Bin Ladin's 1998 declaration was only the latest in the long series of his public and private calls since 1992 that singled out the United States for attack. 41 U.S. Marines, the 1992 bombing in Aden, and especially the 1993 firefight in Somalia after which the United States "left the area carrying disappointment, humiliation, defeat and your dead with you." Bin Ladin said in his ABC interview that he and his followers had been preparing in Somalia for another long struggle, like that against the Soviets in Afghanistan, but "the United States rushed out of Somalia in shame and disgrace." Citing the Soviet army's withdrawal from Afghanistan as proof that a ragged army of dedicated Muslims could overcome a superpower, he told the interviewer: "We are certain that we shall-with the grace of Allah-prevail over the Americans." He went on to warn that "If the present injustice continues . . . , it will inevitably move the battle to American soil." Plans to attack the United States were developed with unwavering single-mindedness throughout the 1990s. Bin Ladin saw himself as called "to follow in the footsteps of the Messenger and to communicate his message to all nations,"and to serve as the rallying point and organizer of a new kind of war to destroy America and bring the world to Islam. It is the story of eccentric and violent ideas sprouting in the fertile ground of political and social turmoil. It is the story of an organization poised to seize its historical moment. How did Bin Ladin-with his call for the indiscriminate killing of Americans-win thousands of followers and some degree of approval from millions more? The history, culture, and body of beliefs from which Bin Ladin has shaped and spread his message are largely unknown to many Americans. Seizing on symbols of Islam's past greatness, he promises to restore pride to people who consider themselves the victims of successive foreign masters. He uses cultural and religious allusions to the holy Qur'an and some of its interpreters. He appeals to people disoriented by cyclonic change as they confront modernity and globalization. His rhetoric selectively draws from multiple sources-Islam, history, and the region's political and economic malaise. He also stresses grievances against the United States widely shared in the Muslim world. He inveighed against the presence of U.S. troops in Saudi Arabia, the home of Islam's holiest sites. He spoke of the suffering of the Iraqi people as a result of sanctions imposed after the Gulf War, and he protested U.S. support of Israel. Islam is divided into two main branches, Sunni and Shia. Soon after the Prophet's death, the question of choosing a new leader, or caliph, for the Muslim community, or Ummah, arose. Initially, his successors could be drawn from the Prophet's contemporaries, but with time, this was no longer possible. Those who became the Shia held that any leader of the Ummah must be a direct descendant of the Prophet; those who became the Sunni argued that lineal descent was not required if the candidate met other standards of faith and knowledge. After bloody struggles, the Sunni became (and remain) the majority sect. (The Shia are dominant in Iran.) The Caliphate-the institutionalized leadership of the Ummah-thus was a Sunni institution that continued until 1924, first under Arab and eventually under Ottoman Turkish control. Many Muslims look back at the century after the revelations to the Prophet Mohammed as a golden age. Its memory is strongest among the Arabs. What happened then-the spread of Islam from the Arabian Peninsula throughout the Middle East, North Africa, and even into Europe within less than a century-seemed, and seems, miraculous. Nostalgia for Islam's past glory remains a powerful force. Islam is both a faith and a code of conduct for all aspects of life. For many Muslims, a good government would be one guided by the moral principles of their faith. This does not necessarily translate into a desire for clerical rule and the abolition of a secular state. It does mean that some Muslims tend to be uncomfortable with distinctions between religion and state, though Muslim rulers throughout history have readily separated the two. To extremists, however, such divisions, as well as the existence of parliaments and legislation, only prove these rulers to be false Muslims usurping God's authority over all aspects of life. Periodically, the Islamic world has seen surges of what, for want of a better term, is often labeled "fundamentalism." Denouncing waywardness among the faithful, some clerics have appealed for a return to observance of the literal teachings of the Qur'an and Hadith. One scholar from the fourteenth century from whom Bin Ladin selectively quotes, Ibn Taimiyyah, condemned both corrupt rulers and the clerics who failed to criticize them. He urged Muslims to read the Qur'an and the Hadith for themselves, not to depend solely on learned interpreters like himself but to hold one another to account for the quality of their observance. The extreme Islamist version of history blames the decline from Islam's golden age on the rulers and people who turned away from the true path of their religion, thereby leaving Islam vulnerable to encroaching foreign powers eager to steal their land, wealth, and even their souls. Despite his claims to universal leadership, Bin Ladin offers an extreme view of Islamic history designed to appeal mainly to Arabs and Sunnis. He draws on fundamentalists who blame the eventual destruction of the Caliphate on leaders who abandoned the pure path of religious devotion. He repeatedly calls on his followers to embrace martyrdom since "the walls of oppression and humiliation cannot be demolished except in a rain of bullets." For those yearning for a lost sense of order in an older, more tranquil world, he offers his "Caliphate" as an imagined alternative to today's uncertainty. For others, he offers simplistic conspiracies to explain their world. executed in 1966 on charges of attempting to overthrow the government, Qutb mixed Islamic scholarship with a very superficial acquaintance with Western history and thought. Sent by the Egyptian government to study in the United States in the late 1940s, Qutb returned with an enormous loathing of Western society and history. He dismissed Western achievements as entirely material, arguing that Western society possesses "nothing that will satisfy its own conscience and justify its existence." Three basic themes emerge from Qutb's writings. First, he claimed that the world was beset with barbarism, licentiousness, and unbelief (a condition he called jahiliyya, the religious term for the period of ignorance prior to the revelations given to the Prophet Mohammed). Qutb argued that humans can choose only between Islam and jahiliyya. Second, he warned that more people, including Muslims, were attracted to jahiliyya and its material comforts than to his view of Islam; jahiliyya could therefore triumph over Islam. Third, no middle ground exists in what Qutb conceived as a struggle between God and Satan.All Muslims-as he defined them-therefore must take up arms in this fight.Any Muslim who rejects his ideas is just one more nonbeliever worthy of destruction. Bin Ladin shares Qutb's stark view, permitting him and his followers to rationalize even unprovoked mass murder as righteous defense of an embattled faith. Many Americans have wondered, "Why do 'they' hate us?" Some also ask, "What can we do to stop these attacks?" Bin Ladin and al Qaeda have given answers to both these questions. To the first, they say that America had attacked Islam; America is responsible for all conflicts involving Muslims. Thus Americans are blamed when Israelis fight with Palestinians, when Russians fight with Chechens, when Indians fight with Kashmiri Muslims, and when the Philippine government fights ethnic Muslims in its southern islands. America is also held responsible for the governments of Muslim countries, derided by al Qaeda as "your agents." Bin Ladin has stated flatly, "Our fight against these governments is not separate from our fight against you." These charges found a ready audience among millions of Arabs and Muslims angry at the United States because of issues ranging from Iraq to Palestine to America's support for their countries' repressive rulers. Bin Ladin's grievance with the United States may have started in reaction to specific U.S. policies but it quickly became far deeper. To the second question, what America could do, al Qaeda's answer was that America should abandon the Middle East, convert to Islam, and end the immorality and godlessness of its society and culture: "It is saddening to tell you that you are the worst civilization witnessed by the history of mankind." If the United States did not comply, it would be at war with the Islamic nation, a nation that al Qaeda's leaders said "desires death more than you desire life." Few fundamentalist movements in the Islamic world gained lasting political power. In the nineteenth and twentieth centuries, fundamentalists helped articulate anticolonial grievances but played little role in the overwhelmingly secular struggles for independence after World War I. Western-educated lawyers, soldiers, and officials led most independence movements, and clerical influence and traditional culture were seen as obstacles to national progress. After gaining independence from Western powers following World War II, the Arab Middle East followed an arc from initial pride and optimism to today's mix of indifference, cynicism, and despair. In several countries, a dynastic state already existed or was quickly established under a paramount tribal family. Monarchies in countries such as Saudi Arabia, Morocco, and Jordan still survive today. Those in Egypt, Libya, Iraq, and Yemen were eventually overthrown by secular nationalist revolutionaries. The secular regimes promised a glowing future, often tied to sweeping ideologies (such as those promoted by Egyptian President Gamal Abdel Nasser's Arab Socialism or the Ba'ath Party of Syria and Iraq) that called for a single, secular Arab state. However, what emerged were almost invariably autocratic regimes that were usually unwilling to tolerate any opposition-even in countries, such as Egypt, that had a parliamentary tradition. Over time, their policies-repression, rewards, emigration, and the displacement of popular anger onto scapegoats (generally foreign)-were shaped by the desire to cling to power. The bankruptcy of secular, autocratic nationalism was evident across the Muslim world by the late 1970s.At the same time, these regimes had closed off nearly all paths for peaceful opposition, forcing their critics to choose silence, exile, or violent opposition. Iran's 1979 revolution swept a Shia theocracy into power. Its success encouraged Sunni fundamentalists elsewhere. In the 1980s, awash in sudden oil wealth, Saudi Arabia competed with Shia Iran to promote its Sunni fundamentalist interpretation of Islam, Wahhabism. The Saudi government, always conscious of its duties as the custodian of Islam's holiest places, joined with wealthy Arabs from the Kingdom and other states bordering the Persian Gulf in donating money to build mosques and religious schools that could preach and teach their interpretation of Islamic doctrine. In this competition for legitimacy, secular regimes had no alternative to offer. Instead, in a number of cases their rulers sought to buy off local Islamist movements by ceding control of many social and educational issues. Emboldened rather than satisfied, the Islamists continued to push for power-a trend especially clear in Egypt. Confronted with a violent Islamist movement that killed President Anwar Sadat in 1981, the Egyptian government combined harsh repression of Islamic militants with harassment of moderate Islamic scholars and authors, driving many into exile. In Pakistan, a military regime sought to justify its seizure of power by a pious public stance and an embrace of unprecedented Islamist influence on education and society. These experiments in political Islam faltered during the 1990s: the Iranian revolution lost momentum, prestige, and public support, and Pakistan's rulers found that most of its population had little enthusiasm for fundamentalist Islam. Islamist revival movements gained followers across the Muslim world, but failed to secure political power except in Iran and Sudan. In Algeria, where in 1991 Islamists seemed almost certain to win power through the ballot box, the military preempted their victory, triggering a brutal civil war that continues today. Opponents of today's rulers have few, if any, ways to participate in the existing political system. They are thus a ready audience for calls to Muslims to purify their society, reject unwelcome modernization, and adhere strictly to the Sharia. In the 1970s and early 1980s, an unprecedented flood of wealth led the then largely unmodernized oil states to attempt to shortcut decades of development. They funded huge infrastructure projects, vastly expanded education, and created subsidized social welfare programs. These programs established a widespread feeling of entitlement without a corresponding sense of social obligations. By the late 1980s, diminishing oil revenues, the economic drain from many unprofitable development projects, and population growth made these entitlement programs unsustainable. The resulting cutbacks created enormous resentment among recipients who had come to see government largesse as their right. This resentment was further stoked by public understanding of how much oil income had gone straight into the pockets of the rulers, their friends, and their helpers. Unlike the oil states (or Afghanistan, where real economic development has barely begun), the other Arab nations and Pakistan once had seemed headed toward balanced modernization. The established commercial, financial, and industrial sectors in these states, supported by an entrepreneurial spirit and widespread understanding of free enterprise, augured well. But unprofitable heavy industry, state monopolies, and opaque bureaucracies slowly stifled growth. More importantly, these state-centered regimes placed their highest priority on preserving the elite's grip on national wealth. Unwilling to foster dynamic economies that could create jobs attractive to educated young men, the countries became economically stagnant and reliant on the safety valve of worker emigration either to the Arab oil states or to the West. Furthermore, the repression and isolation of women in many Muslim countries have not only seriously limited individual opportunity but also crippled overall economic productivity. By the 1990s, high birthrates and declining rates of infant mortality had produced a common problem throughout the Muslim world: a large, steadily increasing population of young men without any reasonable expectation of suitable or steady employment-a sure prescription for social turbulence. Many of these young men, such as the enormous number trained only in religious schools, lacked the skills needed by their societies. Far more acquired valuable skills but lived in stagnant economies that could not generate satisfying jobs. Millions, pursuing secular as well as religious studies, were products of educational systems that generally devoted little if any attention to the rest of the world's thought, history, and culture. The secular education reflected a strong cultural preference for technical fields over the humanities and social sciences. Many of these young men, even if able to study abroad, lacked the perspective and skills needed to understand a different culture. Frustrated in their search for a decent living, unable to benefit from an education often obtained at the cost of great family sacrifice, and blocked from starting families of their own, some of these young men were easy targets for radicalization. Most Muslims prefer a peaceful and inclusive vision of their faith, not the violent sectarianism of Bin Ladin. Among Arabs, Bin Ladin's followers are commonly nicknamed takfiri, or "those who define other Muslims as unbelievers," because of their readiness to demonize and murder those with whom they disagree. Beyond the theology lies the simple human fact that most Muslims, like most other human beings, are repelled by mass murder and barbarism whatever their justification. "All Americans must recognize that the face of terror is not the true face of Islam," President Bush observed. "Islam is a faith that brings comfort to a billion people around the world. It's a faith that has made brothers and sisters of every race. It's a faith based upon love, not hate." Yet as political, social, and economic problems created flammable societies, Bin Ladin used Islam's most extreme, fundamentalist traditions as his match. All these elements-including religion-combined in an explosive compound. Other extremists had, and have, followings of their own. But in appealing to societies full of discontent, Bin Ladin remained credible as other leaders and symbols faded. He could stand as a symbol of resistance-above all, resistance to the West and to America. He could present himself and his allies as victorious warriors in the one great successful experience for Islamic militancy in the 1980s: the Afghan jihad against the Soviet occupation. By 1998, Bin Ladin had a distinctive appeal, as he focused on attacking America. He argued that other extremists, who aimed at local rulers or Israel, did not go far enough. They had not taken on what he called "the head of the snake." Finally, Bin Ladin had another advantage: a substantial, worldwide organization. By the time he issued his February 1998 declaration of war, Bin Ladin had nurtured that organization for nearly ten years. He could attract, train, and use recruits for ever more ambitious attacks, rallying new adherents with each demonstration that his was the movement of the future. "And as I looked at those demolished towers in Lebanon, it entered my mind that we should punish the oppressor in kind and that we should destroy towers in America in order that they taste some of what we tasted and so that they be deterred from killing our women and children."